Zehnder’s Splash Village will once again be offering swimming lessons for the Preschool through Level 5, Adult and Special Needs. In addition, they are offering Water Baby Classes. Lessons are held at Zehnder’s Splash Village in the Tower Building Pool by Red Cross Certified Water Safety Instructors. All classes are one hour for 5 weeks. Classes are limited to 20 students per class and upon completion, students will receive a certificate of Achievement and a Zehnder’s Splash Village day pass. Cost for classes is $55 per child. To sign up for classes you can download a registration form here. Water babies is designed to help the child become comfortable in the water with the assistance of a parent. Recommended for children under 4. Pre-introduction to water skills: Helps students become comfortable in the water without the assistance of a parent. Prerequisites: Must be able to remain in the water without a parent. Must be able to follow instructor’s directions. Must be able to sit with the other students on the bench with very little assistance. Introduction to water skills: Helps students feel more comfortable in the water and to enjoy the water safely. Introduce the student to basic swimming skills with assistance. Prerequisites: Must have completed Fundamentals or show proficiency in Fundamentals exit skills. Must be able to follow instructor’s directions. Must be able to remain seated with other students without assistance until his/her turn. Fundamental Aquatic Skills: Gives student success with Fundamental Skills. Prerequisites: Must have completed Level 1 or show proficiency in Level 1 exit skills. Must be able to follow all instructor’s directions. Must be able to remain seated with other students without assistance until his/her turn. Stroke Development: Builds on the skills from Level 2 by providing additional guided practice. Prerequisites: Must have completed Level 2 or show proficiency in Level 2 exit skills. Must be able to follow all instructor’s directions. Must be able to remain seated with other students without assistance until his/her turn. Stroke Improvement: Develops confidence in the strokes learned and to improve other aquatic skills. Prerequisites: Must have completed Level 3 or show proficiency in Level 3 exit skills. Must be able to follow all instructor’s directions. Must be able to remain seated with other students without assistance until his/her turn. Stroke Refinement: Provides further coordination and refinement of strokes. Prerequisites: Must have completed Level 4 or show proficiency in Level 4 exit skills. Must be able to follow all instructors directions. Must be able to remain seated with other students without assistance until his/her turn. If you have always wanted to learn but never had the opportunity, here is your chance. You will be taught to swim on your front and back in a comfortable environment. Experienced Instructors will teach the joys of swimming to those with special needs and disabilities. Please download brochure for current rates. Thank you! 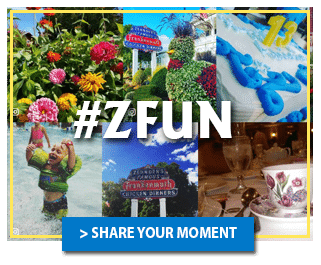 Upon completion of session, students will receive a certificate of achievement and a Zehnder’s Splash Village day pass. We also offer private lessons. Zehnder's Splash Village will once again be offering swimming lessons for the Preschool through Level 5, Adult and Special Needs from January 15 through April 11, 2017. In addition, they are offering Water Baby Classes. Lessons begin January 15th at Zehnder's Splash Village in the Tower Building Pool by Red Cross Certified Water Safety Instructors.